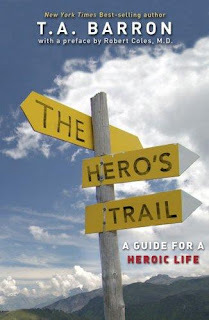 This summer you read The Hero's Trail. Please leave a comment telling which one hero in the book made the greatest impression on you. Write at least three sentences using good punctuation, spelling, and capitalization. You are welcome to use your book to refresh your memory. Personally, I believe that one of the most impressive heroes is Anne Frank. Her courage and her ability to look for the best in people is remarkable. She is a role model for anyone who goes through difficult experiences. This is an example too. i believe that Wilma Rudolph was very fascinating to have polio and come back and be one of the best runners in the world! all of the gold medals sh won and everything was just incredible. anyone to be able to do that had to have god with them and watching over them the whole time! That's what i thought about the story of Wilma Rudolph. Ruby Bridges is an example to all to face all those people that were hated her without even knowing her. She faced the world and went to that school. She is an example in everything I do! and heart jumping into a swimming pool even though he couldnt swim. Just to save his brother. So thats why I like Sherwin Long. I think Wilma Rudolph was very consistent that she had polio and then she fought it off and started walking and running.I think it was fascinating how many races she won.It was very cool how she lived in Tennessee. I think JOE Derat,JR. is a good roll model. Joe Derat,JR. has a speech problem. This story shows how he stands up for himself and over comes his fears. I think Ruby Bridges was very brave to be able to walk into a all white school.She was a very good roll model.Ruby Bridges was a very confident. Ruby Brides is a very brave girl.I know what she feels.I felt the same way she did when I was a little girl.I had to go to a new school. She is an example for everyone. i think ruby bridges is a very brave young girl. She stood up for her rights in it dosen't matter what the color of my skin is.that's why Ruby Bridges is my favorite hero. I think that Wilma Rudolph is important,because she tried to walk again.I think that having scarlet fever ,pneumonia,and polio was hard on her.Finally she became the fastest lady runner in the world. happened...she crashed in to another skater! Her leg was cut. It was awful and she couldn't bear to put her skates on again. But she conquered her fears and nearly a decade later, in 1956, Carol skated her way to the world champion! Also, Tenley Albright was another courageous skater who fought childhood polo. My favorite hero is Wilma Rudolph. Even though she had a hurt leg she became an amazing athlete. If that had happened to me I would not become the fastest person in the world. i think Ruby Bridges is very courageous.She stood up for herself.She didn't care what other people said about her.That's why i like her. Wilma Rudolph is my favorite hero. I can't believe she won so many gold medals. Even after she overcame polio. If I had polio I couldn't ever do that. My favorite hero is Sadako Sasaki. She never gave up hope. She had people to help her, and friends to comfort her. Last year we made 1000 paper crains just like she did. My favorite was Wilma Rudolph! She showed effort and perseverance. She never gave up when she thought she would never walk again. She became one of the worlds best runners. My favorite is Anne Frank. She had hope, courage and perseverance. It was impressive how she kept all her thoughts in a diary at that time when she was so scared. Evan though some people were mean she still belived that people had good hearts. She was a hero!!! My favorite hero is definitely Anne Frank.I think it is so cool how after she died her diary was uncovered!I think it would be awesome to get to read her diary some time! !I also admire how brave she was!!! She definitely had all the traits of being a hero!!! !I hope that some day I can show as much bravery as Anne Frank!!!!!!! I think Ruby Bridges showed courage when she was the first black girl to enter an all white school. She and her mom had to be escorted by federal marshals through an angry mob of people. If I were her, I would have been scared to death, but Ruby Bridges showed courage by just walking through the crowd of people. I personally think Charles Eastman is my favorite hero because he learned to hunt with a bow and arrow. He got taken away from his tribe, but after all he had been through he learned how to speak another language and he became a nationally known writer and speaker. That's why I think he's my hero! I have to say that my favorite hero was Andrew Holleman. I really like that he researched all that and found out those things. That's why he's my favorite hero. I think that Steven Hawkings is a great role model. He had a LOT of problems but he let nothing get him down. He even built a device to do the talking for him. i think that wilma roudolph beacause she is amazing. She survied polio and a twisted leg. she won the olmpics. I love andrew holleman.I love his research.And I found so many things about him. I think Esther is a hero because she had the courage to stand up for people. A law was passed and the Jews were going to be killed. But Esther was brave enough to go before the King and tell him that he was being tricked by Haman,the King's royal advisor. Thanks to Esther,the Jews were saved. That's why Esther is a hero. I think Ruby Bridges is a great role model. Even though people hated her, she stood up for herself and went to that school. She is a good example for anyone! I think Wilma Roudolph is my hero.She wanted to run but she couldn't. Then she ran in the olympics and won. A personal favorite of mine is Lance Armstrong. I think that Melinda is my favorite hero. I think she's my favorite because she is very courageous to put her life on the line. I think it was very heroic of her to save her little brother a burning building. My hero is Wilma Rudolph.I think she showed courage because she kept trying to walk. I was amazed that she was so fast when she couldn't run for ten years. I loved the book but it was not just not my gene. My favorite hero was Louis Armstrong. My hero is Melinda Clark. Her house was on fire, and she went back in the house to save her little brother. Now that's what I call courage! and that is my favorite hero. My favorite hero is Joe Derat Jr. I like how he stands up for himself. he has courage and is very brave! I can not imagine doing that. Ruby Bridges going to an all white school must had been hard. It's so sad that she had to go through a crowd of people just to go to school. It's bad enough having not having any friends. I strongly belive Sherwin Long is truely one of the best heros ever. He saved his six year old brother from drownding in the deep end of the pool,when he himself at the age of nine could not swim.Still he rescued his brother from death and that is why I beleive Sherwin Long is a true hero. My favorite hero from the book is Wilma Rudolph.Her story is inspiring because she could barely walk as a child.Her determination and will to walk helped her be able to run as well.She went on to win Olympic medals. Ruby Bridges is a example to all.To face all those people who hated her without even knowing her.She faced the world and went to that school no matter what people said about her.She was so brave.She is an example in everything I do. My favorite hero from the book is Glenn Cunningham. I admire him because of his determination and faith. He believed in himself and not only did he walk again he set the record for the fastest mile. He is a true hero to me. My favorite hero from the book was Wilma Rudolph. I think she is my favorite hero because everybody thought she couldn't walk except her. She took her brace off then stood up by herself and walked to her mothers arms. Then she went to the Olympics and won three medals. Thats why I think Wilma Rudolph is my favorite hero from the book. I think Wilma Rudolph has tons of perseverance. I think it would take tons perseverance to overcome:scarlet fever,pneumonia, and polio. It is amazing that she went on to win Olympic medals despite being so sick. That's why she's my favorite hero from The Hero's Trail. I think Ruby Bridges had lots of courage to go to an all white school, when it was prohibited. She was brave when the whites were going against her beliefs. She has one of the most heroic stories I have read. Therefore, she is my favorite person from The Hero's Trail. I think Lauren Detrich is my favorite. Because she is cheerful even when she has cystic fibrosis. So Lauren Detrich is my favorite person to read about in the hero's trail. I think my favorite character was Sherwin Long.He saved his brother from drowning and risked drowning himself.I like Sherwan Long because he knows when to put others first thats why he is my favorite person from the hero's trail. My favorite character is Wilma Rudolph. She is a role model to all women.That is why she is my favorite. My favorit hero in the Hero's Trail Was Wilma Dolph because it was amazing that she could run after with a some kind of desease in her leg and she got gold medels won lots of races but my goodness thats Incredible! Ben McDonald's story was my favorite story.He showed to have courage in the good and bad times. Valerie Edwards and Erin Scheide mad a very big difference in drunk driving. They went through allot to make the drunk driving law more punishable. Michaella Gallina i like her because she helped chidren think how it didnt matter about not being able to move as easily and having fun by riding horses and playing alot of other games. Wilma Rudolph is my favorite hero because she fought through childhood polio and she still won three gold medals in the Olympics! She had to be very brave. That's why she's my favorite hero. I'd like to get to bed earlier so I wouldn't be as tired in the morning. I think that would be a big thing for me. I would do better in school. I would would be a christan.I would like to be a cristan because I can go to heaven.That is what I would like to do. being a hero like in the Hero's Trail. I want to be better at standing up for myself. If I could change things about myself I would get up early.I help my brothers at sports.Thats what I would do. If I could change myself. I would try not to be self-centered, but to help to people in need. If I could change myself, I would help people in need of shelter, food, and most of all a family. If i could change myself.I would become a better christian.And go to heaven. I would become a Christian. Christians do so many nice things. I would aim to go to heaven. I would be Iqbal Masih because he saved a lot of slaved people.He also loved athletics.Even though he died at a young age of 12!